After the initial setup described in the first post, it was time to bring in a professional to install the gateway. That was followed by a spectral analysis and some preliminary range testing. 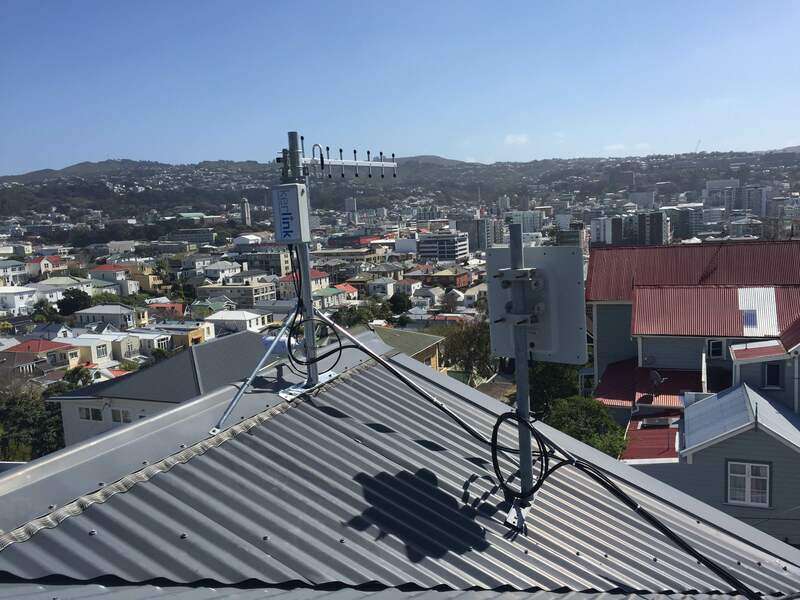 The gateway was installed on a rooftop of a house in Austin Street, Mount Victoria. It required robust arrangements given the howling winds we get here in Wellington. The only other major consideration was the antenna. Instead of using the omni supplied, a 12 dBi Yagi antenna was used to get better coverage. Being highly directional, the Yagi is pointed towards the Wellington CBD. 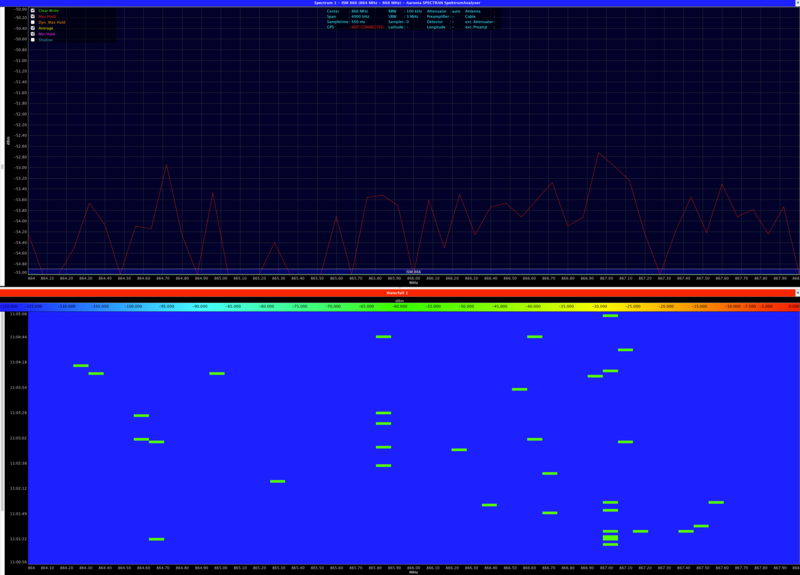 One of the potential challenges in using unlicensed spectrum is noise and the extent to which other people are using it. This requires a spectral scan. The results for the 864 to 868 MHz band, which is what KotahiNet intends to use, were great. They showed little noise and usage. Given the frequency hopping used by the network, there should be no problems and gives confidence that unlicensed 868 MHz (aligning with the EU) is a good choice. The spectral scan showed lower usage in the lower end of the band. It’s therefore an easy decision to place the gateway channels there. The single installed gateway should be able to cover much of the Wellington CBD. More testing is required to confirm exactly how much and if there are any coverage dead spots. A challenge in Wellington, and NZ generally, is going to be hills. I therefore wanted to test that out. This involved placing a sensor node (red pin on map) 2.8 km from the gateway (blue pin). In between is Mount Victoria which creates a massive physical barrier between the Wellington CBD and Eastern Suburbs. Not only that but the directional antenna is facing the other side, towards the CBD. I therefore didn’t expect the sensor node to connect at all but it did. Boosting transmission power to the maximum 20 dBm, around 80% of all data is getting to the gateway with RSSI around -110 dBm and SNR varying -8 to -18 dB. A further tweak- increasing the number of retries to send data- leads to almost 100% data transmission. That’s really impressive and confirms that the network can not only work line of sight and through buildings, it has a good ability to handle hills too. ← What’s the network good for?